It’s been a while since I went to my lessons last time. Today the knot we worked on was called ‘kazeno sasayaki’ (whispers of the wind). It’s tied using two sashes that are not as wide as the regular sash. 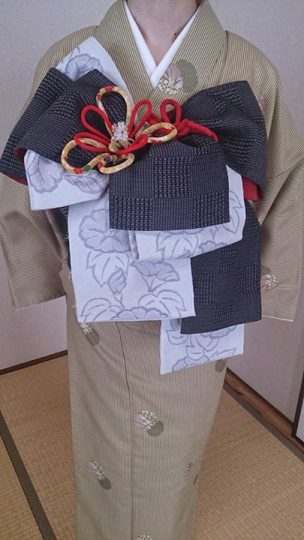 A gorgeous knot with a splendor that would work with the ‘furisode’ (long-sleeved formal) kimono. This time I used a reversible sash as well, so the result is even more colourful!